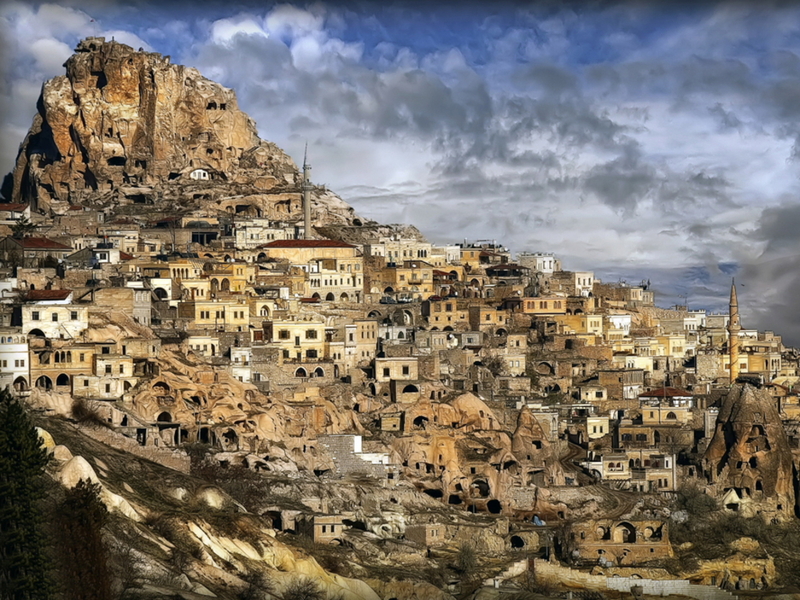 The unique landscape of Cappadocia is now one of the star attractions of Turkey, yet on first impression it can seem a disturbing place. The still dryness and omnipresent dust give an impression of barrenness, and the light changes with dramatic effect to further startle the observer. 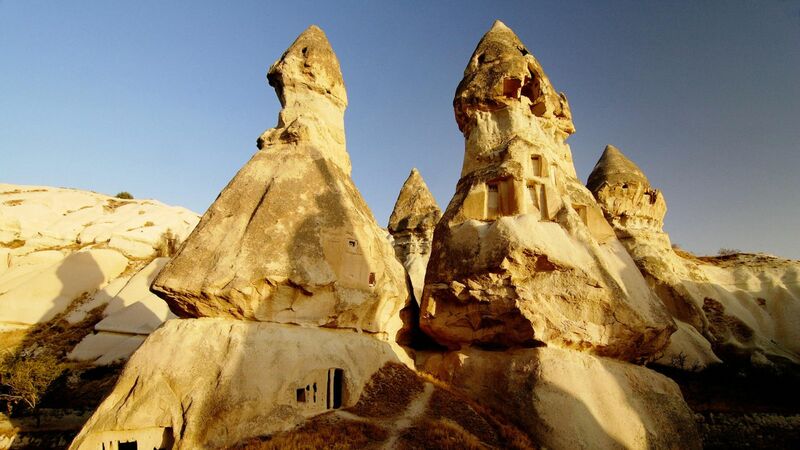 Only with time comes the realization that the volcanic tuff that forms the land is exceedingly fertile, and that these weird formations of soft, dusty rock have been lived in over millennia by many varying cultures. The most fascinating aspect of a visit here is the impression of continuity: rock caves are still inhabited and pottery is still made from the clay of the main river, the Kızılırmak. Wine is produced locally as it has been since Hittite times, and the horses from which the region takes its name (Cappadocia translates from the Hittite as “land of well-bred horses”) are still to some extent used in the region, along with mules and donkeys. The peaks of three volcanoes – Erciyes, Hasan and Melendiz Dağları – dominate Cappadocia. 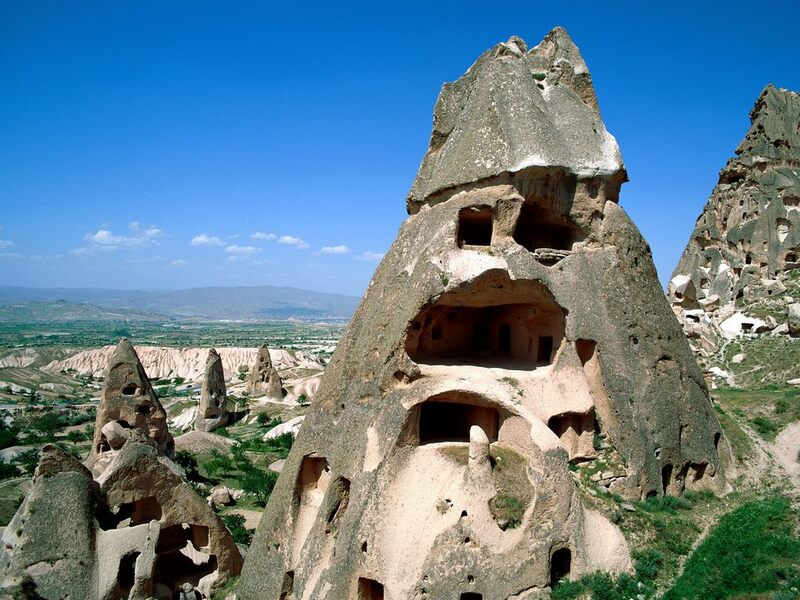 It was their eruptions some thirty million years ago, covering the former plateau of Ürgüp in ash and mud, that provided the region’s raw material: tuff. This soft stone, formed by compressed volcanic ash, has been worked on ever since, by processes of erosion, to form the valleys and curious fairy chimney rock formations for which the region is so famous. 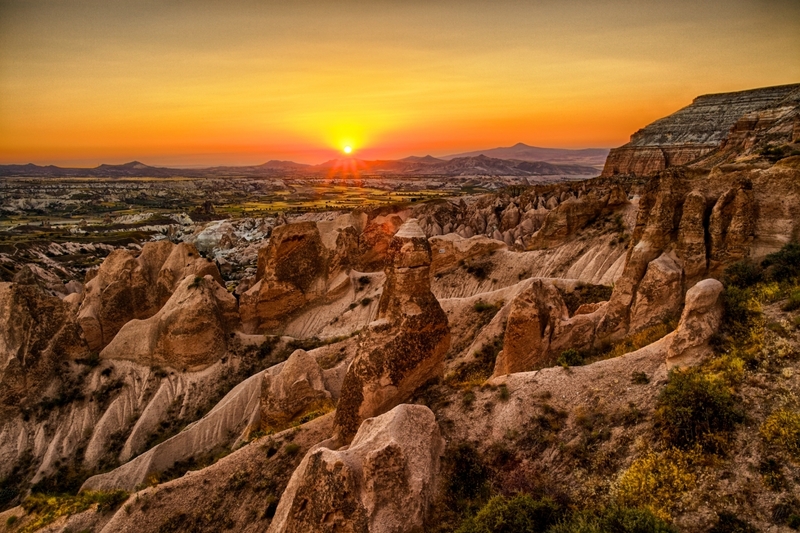 The original eruptions created a vast erosion basin, dipping slightly towards the Kızılırmak River, which marks an abrupt division between the fantasy landscape of rocky Cappadocia and the green farmland around Kayseri. Where the tuff is mixed with rock, usually basalt, the erosion process can result in the famous cone-shape chimneys: the tuff surrounding the basalt is worn away, until it stands at the top of a large cone. Eventually the underpart is eaten away to such an extent that it can no longer hold its capital: the whole thing collapses and the process starts again. 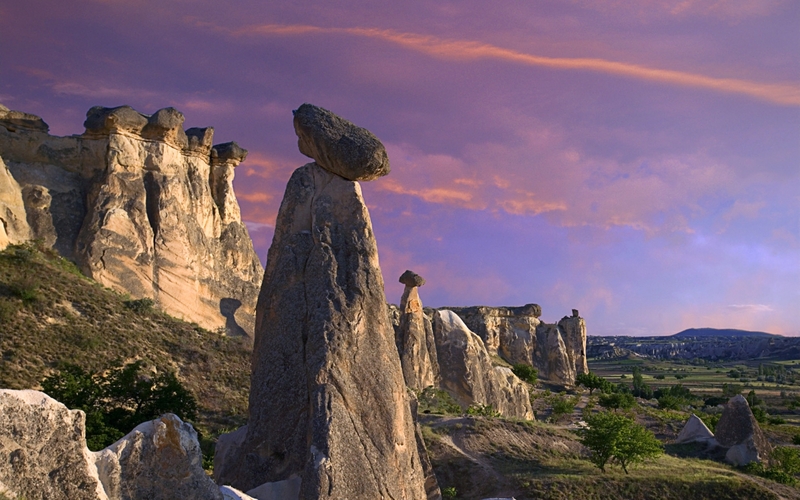 In the Cemil valley, near Mustafapaşa, the cones give way to tabular formations – table mountains – caused by the deep grooves made by rivers in the harder geological layers. Another important region lies to the northwest of the Melendiz mountain range, the valley of the Melendiz Suyu, or Ihlara valley. The most individual feature of this region is the red canyon through which the river flows, probably the most beautiful of all the Cappadocian landscapes.